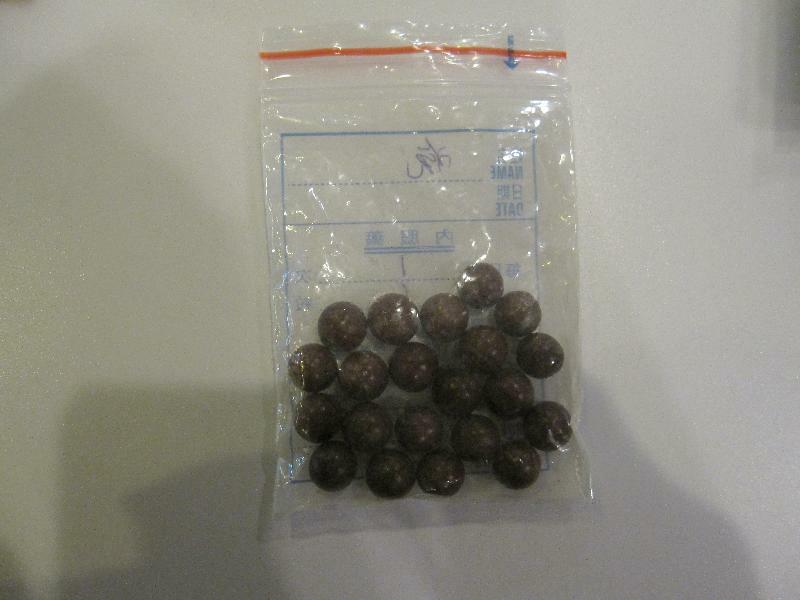 The Department of Health (DH) today (October 20) urged clients of registered Chinese medicine practitioner (CMP) Lau Yuen-pang practising in Room 2, 18/F, Wealthy Plaza, 138 Shau Kei Wan Road, Sai Wan Ho, not to consume brown herbal pills (see photo) he prescribed as they are suspected to contain a high level of aconitine content which can cause poisoning symptoms. A suspected poisoning case involving aconitum alkaloids affecting a male patient, aged 71 with underlying illnesses, was notified. He consulted the above CMP for sciatica pain on October 10 and developed perioral, facial and limb numbness about four hours after consumption of six of the above pills the CMP prescribed. He attended Pamela Youde Nethersole Eastern Hospital on the same day and was admitted to the Intensive Care Unit for further management. He was discharged on October 16. Laboratory testing detected aconitum alkaloids in both the patient's urine sample and the remnant of the pills. Of note, a high level of aconitine content was detected in the pill remnant upon testing by the Government Laboratory. The DH immediately conducted field investigations where the CMP practised and initial enquiries revealed that the CMP had purchased the pills in the Mainland and prescribed them to patients under his direct care mostly for joint pain and muscle weakness. Investigations are ongoing. "Aconitine, a kind of aconitum alkaloid, is found in a number of herbs. If improperly used, aconitum alkaloids can cause poisoning symptoms including perioral and limb numbness, dizziness, nausea, vomiting, diarrhoea, weak pulse and shortness of breath. It can be fatal in severe cases," a spokesman for the DH said. "No other adverse reports related to this incident have been received so far. The CMP has been requested to contact his clients for medical surveillance," the spokesman added. The DH has set up a hotline (2125 1133) for public enquiries related to herbal pills prescribed by the above CMP. It will operate from 9am to 5pm including this weekend. According to section 54 of the Public Health and Municipal Services Ordinance (Cap 132), those selling or possessing for sale any drug intended for use by man but unfit for that purpose are liable to a maximum penalty of a fine of $50,000 and six months' imprisonment. Upon completion of the investigations, the DH will work with the Department of Justice on prosecution matters and will also refer the case to the Chinese Medicine Council of Hong Kong for consideration of possible disciplinary action. Members of the public prescribed with medicines by the above CMP and in doubt should consult healthcare professionals as soon as possible. They should submit the medicines to the DH's Chinese Medicine Division at 16/F, AIA Kowloon Tower, Landmark East, 100 How Ming Street, Kwun Tong, during office hours for disposal.